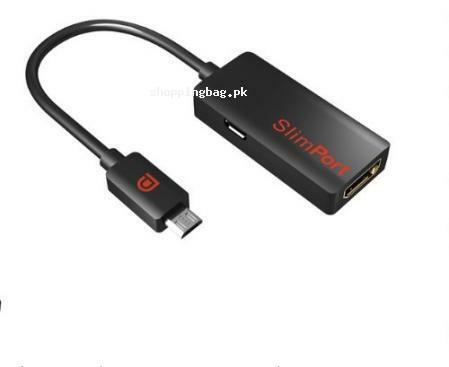 The exclusive Slimport to Hdmi HDTV Adapter cable online in Pakistan is available in our online collection in best price in Pakistan. You can find this HDTV Adapter cable price in Pakistan and place your order to buy it at your home with cash on delivery provision all over Pakistan. This device is compatible with LG G2, Google Nexus 4, E960, and Nexus 7 II ASUS and available for online shopping in Pakistan. It connects the mobile phone with the big screens to the resolution of 1080p HD. This Slimport HDTV Adapter Cable has USB connector to connect the devices. This amazing product is available for online shopping in Pakistan. Now you can enjoy movies and videos on big screen with your mobile phone. Place your order now to buy this HDTV Adapter Cable online in Pakistan in reasonable price in Pakistan and the product will be available to you at your doorstep with cash on delivery facility. You can also find more unique and quality imported from Amazon products in our online collection available for online shopping in Pakistan. You can enjoy online shopping in Pakistan with ease and avoiding hassle. Slimport to HDMI Adapter, Connect mobile devices to any big screen.High speed micro USB(male) to HDMI(female) connector.